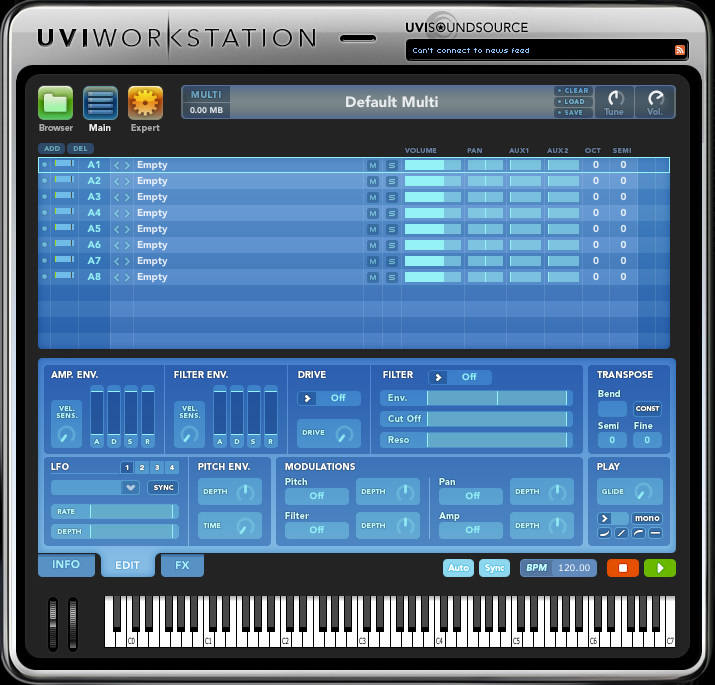 Multi-timbral virtual instrument that gives you unlimited parts, built in effects, functionality for live performance, and an intuitive real-time workflow. New UVI Engine XT design provides superior sound quality and functionality. 100% compatible with the UVI Soundcards from Ultimate Sound Bank. Easily expandable with new Soundpack downloads from UVISoundsource.com. Supports all major plug-in formats (Audio Units, VST, RTAS, MAS). Manage instruments and loops in the same interface. New "info" section with text, pictures, and website link. Cross-platform Multi's with host compatible. Complete professional effects arsenal, with easy editing (delay, reverb, phaser, chorus, EQ, filter, drive, distortion, compressor...). Direct sync to host: tempo & transport. Real-time sync to the beat: loops are always in time. Sample/Slice Start for loops and phrases. Drag & Drop MIDI & Audio. Import REX files, Apple Loops, AIFF, WAV and more. Direct connection to the UVI SoundSource RSS feed. Bugfix for Issue with sustain pedal and arpegiator in some cases. Bugfix for possible hang when loading session. Bugfix for possible issue with mono mode. Bugfix for possible issue with arpeggiator and scripted instruments. Bugfix for regression crash introduced in previous version with GM Neo-Soul Keys. New streaming engine with special optimization for lossless compressed sample format. Background sample loading resulting in faster instrument loading. CPU optimization of Xpander filter. Fix issue with Progress bar for session reload which fixes related crash when reloading session. Fine tune setting per part. Coarse and Fine tune in Loop edit. Fix issue when reloading some older session. Fix support of CAF format with slice informations (new Apple loops). MSI and Ethno 1 support is back. Display issue with Gypsy Jazzy. Multi reloading with some scripted soundbank. Posted by Khobé on Fri, 07/25/2008 - 01:38. The download went fine but i could never open the app.. Very disapointed. Are you sure that app. is good to run on a Mac. Posted by Stacey on Fri, 07/25/2008 - 05:26. The website says that it runs on Mac OS X. Try contacting the developers directly on this email (publicbeta@uvisoundsource.com) for help.